Adamus Phillida is a commander in the Imperial Legion originally stationed in the Imperial City. Phillida has been in the Imperial Legion for forty years, and has since climbed up to become the highest ranking member of the Legion located in Cyrodiil. He has spent much of his career investigating the Dark Brotherhood and hindering their operations as much as possible. This may be the reason he refuses to help you during a few quests where an Imperial Watchcaptain is needed, as he claims he is too busy with more important tasks. His eventual retirement annoys the Dark Brotherhood enough to send an assassin after him. They reason that someone who hindered them for so long must not be allowed to retire peacefully. Before his retirement, Phillida divides his time between patrolling the streets of the Imperial City and investigating the Dark Brotherhood. He sleeps in the Imperial Legion barracks from midnight to 6am then eats until midday in the Imperial Legion Offices. After lunch he wanders around the Prison District until 4pm and then patrols in the Market District until 8pm. He spends three hours from 8pm until 11pm investigating the Dark Brotherhood shrine in Claudius Arcadia's house. If he has time before bed, he will spend it relaxing in a chair in the Imperial Legion Offices. When the Permanent Retirement quest starts, Phillida will have retired and he is transported to the Leyawiin City Watch Barracks, where he begins a new schedule. He sleeps in the barracks between 2am and 6am then breakfasts until 9am at the Three Sisters' Inn. He then wanders around the Coast Guard Station until 1pm when he heads off for his daily swim. But when he arrives at the side of the lake he will simply stand there till 3pm before he will actually start swimming, which he does until 8pm. Afterwards he spends an hour near the pond, then returns to the Watch Barracks, eating and wandering until his 2am bedtime. After his retirement, Adamus Phillida will be assigned a bodyguard, who follows him everywhere. When Phillida is murdered it will not go unnoticed. His bodyguard takes it personally and commits suicide, regretting his failure to protect Phillida. Furthermore, a special edition of The Black Horse Courier is published: "Adamus Phillida Slain!" 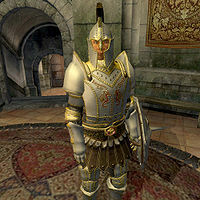 Phillida wears a full set of Imperial Watch armor and fights with his trusty silver longsword. He also has a pair of sack cloth pants, although he only sleeps in them after he moves to Leyawiin. He holds several keys: an Imperial Watch key, an Imperial Watch Office key, the useless Commander's Chest key, and the key to Claudius Arcadia's house. After his retirement, he also gets copies of the Coast Guard Station key, the Castle Leyawiin key, and the Leyawiin City Watch key. He always has a decent amount of gold. Once you have killed Adamus during the related quest, the Finger of Adamus Phillida quest item is added to his inventory. When you speak to Adamus, before the Permanent Retirement quest, he will describe the Imperial City and tell you that his career is at an end: "It is a wonderful city, and I'm proud to have served her for 40 years. But I'm ready to retire, let the young folks take over the reins." When you speak to him during the quest to kill him, he will greet you with, "Do we know each other? There's something familiar about you, but I just can't place it." If you tell him it's time for him to die, he will respond with, "Ah, one of you again, eh? You Dark Brotherhood types are all the same. All sneak and no swing! You'll meet the same fate as the others! En garde!" If you tell him that Sithis needs his soul, he will tell you, "Oh, Sithis needs my soul does he? Well, you can tell your Dread Father that he can kiss my wrinkled arse! Defend yourself, Dark Brotherhood dog!" Both of these remarks are followed by him attacking you. If you choose to say nothing, he will say, "Yes, well... I'm a very busy man. Enjoying my retirement, don't you know. So why don't you just... go away." He will then end the conversation. Ocheeva will give a bit of background information when providing you with the contract: "Adamus Phillida has spent his entire career investigating the Dark Brotherhood, interrupting our contracts, killing our family members! We tried to eliminate Phillida, of course, but failed on three separate occassions [sic]. He's a powerful man, and was surrounded by powerful associates. Now the Legion pig's years of service have come to an end. He has retired. Phillida must not be allowed such a victory! His destiny is... darker. Phillida now resides in Leyawiin, in the City Watch barracks, an honored guest of the soldiers there. He is, in fact, more vulnerable than ever." Once the related quest is started, people will start to comment "So, Adamus Phillida is finally retiring from the Imperial Legion. Spent his life fighting the Dark Brotherhood. Time for a well-earned rest, I'd say." but once it's complete, their hopes for his rest are dashed: "Have you heard? Adamus Phillida has been killed! Murdered by the Dark Brotherhood!" After completing the Deliver the Amulet quest, a note appears on the Prison Sewer entrance that says: "No entry on pain of death. Sealed by authority of Commander Adamus Phillida, Imperial Legion." According to editions of The Black Horse Courier, Phillida denied Hieronymus Lex's requests of having a bounty put on the Gray Fox's head.